Set in a too-near future, the movie explores what people will do when humanity’s last days are at hand. As the respective journeys of Dodge (Mr. Carell) and Penny (Ms. Knightley) converge, their outlooks – if not the world’s – brighten. Download Seeking a Friend for the End of the World in Digital HD from the iTunes store. 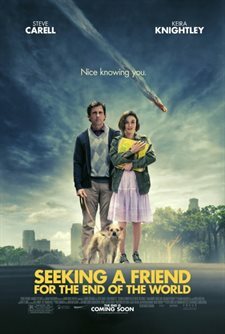 Seeking a Friend for the End of the World images are © Focus Features. All Rights Reserved. Usually with a disaster movie you follow the main characters as they fight for survival. In this case, we have something different: there is no hope for survival. What would you do? Would you party like its 1999? Would you loot? Would you continue about your daily life? Would you spend it with your family? Would you fortify your basement and try to ride it out? Or would you try to find the missed opportunities in your life? The movie follows Dodge, played by Steve Carrell. Dodge's wife leaves him when it is announced that all hope is lost, and we see that he is one of those who try to continue about their daily life to cope. That same night he runs into Penny (played by Keira Knightley), who happens to be breaking up with her boyfriend who lives in Dodge's apartment building. He then discovers that "the one who got away" still has feelings for him. He decides to go out and find her even as the planet is heading for certain doom. While you are expected to have some semblance of suspension of disbelief in these kinds of movies, the utter failure of key elements detracts from the overall story. In the movie the news media mentions the massive breakdown of society continuously but you don't see it after the beginning of the movie – stores are stocked, gas stations are open, and refrigerators are full. A small plane cannot fly as far the movie wants you to think it can. These things just make the movie drag during the second half and distract from what the writers wanted to portray. But by the end you have a half dark comedy and half romance film (that just happens to be set in the backdrop of a disaster kind of like Titanic) that fails to do either one very well and ends in such a way that you will want to put the main characters out of their misery yourself.